Freaking awesome, I will drive this road a lot, I mean a lot! These panoramic shots with mountains in the distance look amazing, very realistic! The graphics designers have done an amazing job! HUGE improvement over the scenery that can be seen in Max's picture - just an abyss of nothingness in the distance! The only thing that bothers me a little bit in these pictures is the look of the truck. I mean, the terrain is dirt, gravel and rocks, but the truck is in a showroom condition and squeaky clean. I think it's high time to make a dirt effect on the trucks as well as truck wash fascilities in the truck stops and in owned garages. I know they can't make the trucks take physical damage due to licensing rules, but I don't think the manufacturers would mind a bit of dirt on their trucks. Along that, maybe also introduce the need to repaint the truck after some time. Vehicles that drive on this type of terrain can take paint damage over time, so chips and scratches may occur. Also the paint can lose it's shine and start to go matte after a couple of years. So an occasional repaint wouldn't be a bad idea. I know - it's pointless, but it's a simulator after all! I agree 100% with you Se7en! 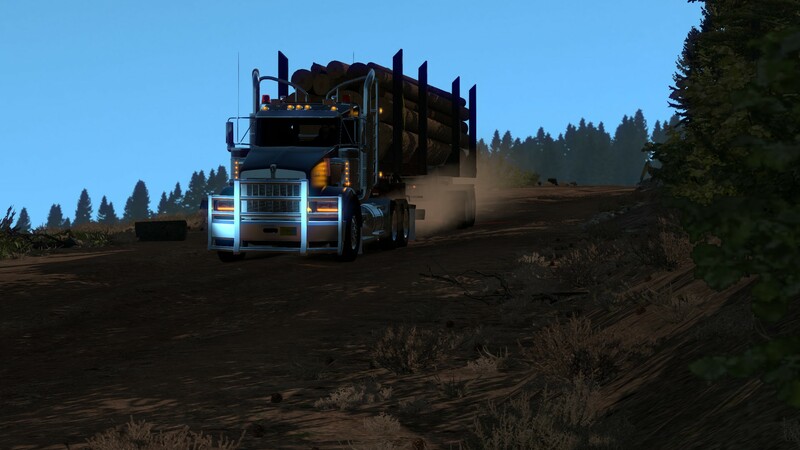 I would like to add: highway trucks that go of road, not realistic, and no headache racks on trucks that haul logs, pipes or flatbeds without a barrier. Also; you have a fully equipped garage, but you have to go to a shop repairs... And it would be nice to have adjustable tandems on the trailers, just like in real life. But don't know if SCS said they where illegal. The box short trailer, dry bulk short and short flatbed are available as doubles over the whole map, also known as STAA doubles. The R.M. (Rocky Mountains) doubles are illegal in California, same goes for Turnpike doubles.